Last Wednesday I was invited to roam around backstage at the Ford Models Supermodel of the World finals, to watch the Nexxus hair team work their magic on the models! 44 girls from 44 countries were prepped by the experts from Nexxus and MAC, then walked in a show featuring Australian designers like Toni Maticevski and Gail Sorronda. Roy Teeluck for Nexxus did the hair, and I was mesmerized. I have never seen a more amazing blowout - smooth, shiny and perfect, with just enough volume to keep it from looking flat. This was the kind of blowout that once you have it, you pray your hair never gets dirty or greasy - so you won't have to wash away all that sleek perfection and start over. If you ever have the opportunity to make an appointment with Roy at his salon, I would highly recommend it. I wish Roy could come to my house and do my hair like this at least twice a week. It would certainly make mornings more tranquil. Sigh. Anyhow! I checked out Roy's table and took some notes on what he used, so if you want this gorgeous straight hair for yourself, here are some Nexxus goodies to try out: a dab of new SleekStyle styling creme on damp hair, then blow dry with a big round brush, and finish with Maxxishine shine spray and a little CombThru hairspray. I also spotted some new RootExxtend volumizer at work; if your straight styles tend to come out too flat, this is an excellent pick. Luckily, I absconded with some of these Nexxus goodies, so look out for reviews of SleekStyle, Maxxishine and new Sleekstress shampoo. SleekStyle and Sleekstress aren't available until March 1, so you'll get the first word here! The hair looked just gorgeous out on the runway; super-shiny (you must get the Maxxishine! ), with great movement, but no flyaways. Perfect! And now that I've gotten the hang of this whole fashion show seating thing, my view was pretty good...I was in the front row, right next to this guy, who you might remember from 7th Heaven and 10 Things I Hate About You. 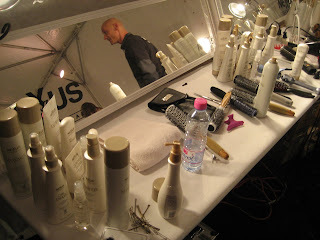 Check out Beauty Addict on Flickr for lots of backstage photos (none of Andrew Keegan though, sorry!). And of course...thanks so much to Cassandra at Kaplow!